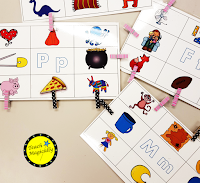 Learning the alphabet and letter sounds are the cornerstone of learning to read. There are many books, rhymes and games to practice. Practice saying the alphabet with motions. 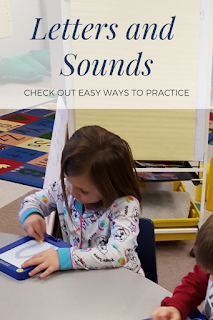 Adding motions makes it easier for some students to remember! Always try to incorporate crossing the midline as you make the movements. You can see these movements in the following video. Popcorn makes letter id fun. Learners pull a card, say the letter and a sound. If they pull a card thats says pop, they must put all the cards back. I also have the students try to come up with another word that has the same sound. This will really help develop flexible thinking skills. Two games in one, gets rave reviews. Students pull a bubblegum circle and say the letter name and sound. Remember: No matter which game you play, always include letter and sound. You can also have the students say a word that starts with the sound and use the word in a sentence. Then match it to their bubblegum machine. There are also picture cards so the students pull the card, say the word, and match the beginning sound. Be sure to use the word in a sentence to develop vocabulary skills. Read more: Fun Bubble Gum! 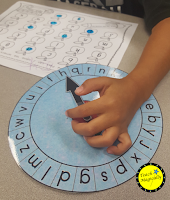 Spin the wheel, say the letter name and sound then find the matching letter. Bingo dabbers always make this game so much fun! Before we begin this activity, we always point to the letters on the recording sheet and read the alphabet. Sometimes we go from A-Z. Other times we go from Z-A. Sometimes we even go in rows, down the page. Comment below with fun things you do to teach letters and sounds!